Attending an international school of music, like the Frost School of Music, is a big step forward in helping you achieve your musical career goals. Whether you want to pursue a career as a performing artist, a music therapist, a composer, a producer, a musicology scholar, a music teacher, or another path, an international school of music can help you get there. Each school offers different programs, so it’s important that you make sure the school you’re applying to has established programs in your desired concentrations. Attaining a music degree helps you get the connections and skills you need to move ahead in your field efficiently. International schools of music are more than happy to talk to you about their programs so that you can determine if you and the school are a good fit. Musicology. Musicology is the historical and sociological study of music. This scholarly field also studies the culture surrounding music. Musicology is appropriate for students who want to combine the social sciences or humanities with music. Performance. Some students are focused primarily on mastering their instrument. Through private lessons, ensembles, and concerts, college is an important time for intensive practice and contributes to mastery. Music Business. Entrepreneurship is a large part of the music business. From drawing up contracts to marketing to working with media contacts, those with an interest in music business will never run out of niches to pursue. Music Production. They work with musicians on all aspects of recording, from arrangement of a song to the order of the songs on an album. Some producers serve in a sound engineering capacity, while others direct additional engineers. Music Engineering. Engineering is similar to production, but is primarily focused on technology. If you have a keen interest in the latest music tech and a great ear, engineering may be a good fit. At a school of music, you can get hands-on experience in the studio. Music Composition. Composition majors create works for performance. They study a range of topics, from learning how to generate ideas to copyright law to notation. Music Therapy. Music therapists use evidence-based techniques to help people improve their health through music. They work with groups—children to the elderly—to participate in music activities. Music therapy is an empathetic and interpersonal profession with many career options. Music Education. Music education majors are trained to teach music to individual students and groups of students. Music education is a field with a long and rich history and includes classes related to pedagogy, educational psychology, and conducting. What Skills Will I Cultivate? Learning from watching and listening to other musicians. Writing and talking about your musical practice and goals. Part of being a creative professional is the ability to create opportunities for yourself. In other words, working as an artist means that you learn to seize opportunities. Well-rounded musicians can advance through their careers quickly. How Important is Applied Experience? Just as no one can learn an instrument by simply listening to others play it, you cannot glean the benefits of a degree by simply watching or reading. Experiential learning is key. Applied experience can take many forms, from music lessons to time in the recording studio to learning together in an ensemble. If you see that a school does not include experiential learning, you may want to keep looking. A variety of degrees are available at an international school of music, and an accredited school of music will offer a variety of focus areas for you to choose from. It can pay off to be an expert in a single area, but it’s also helpful to have a wide range of skills. The most important thing is that you leave the school with extensive real-world experience under your belt. Location is an important consideration when selecting a school of music. The community outside of the school may be just as important as the people inside of it. Does the city have a flourishing music scene? Are alumni of the school visible? In addition to experienced faculty, does the school invite visiting professors and performers to enrich the program’s worldview? Can you see yourself living in that location? An international school of music can help business-minded musicians learn about the particulars of the business aspects of music and entertainment law. The best way to do this is to learn from those actually working in the field. Before you enroll in a school, make sure that the location of the school—and their connections to the local scene—will enrich your experience. 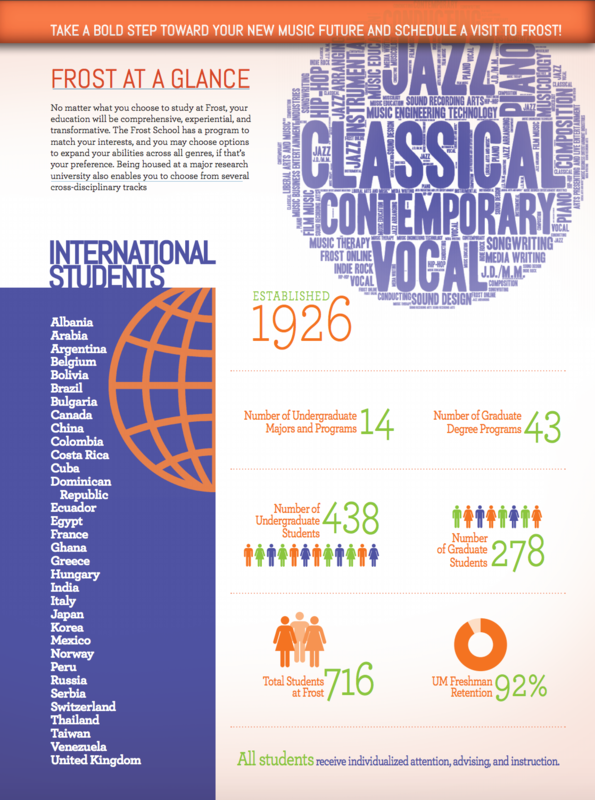 How Do I Select An International School of Music That’s Right for Me? There are a variety of important factors to consider when selecting a school of music. The highest priority is figuring out what you want to get out of your degree. If you plan to combine two or more focus areas of study, make sure that your school allows you to do so. The Frost School of Music employs the Frost Method™, an experiential learning technique that maximizes your learning through applied experiences and small participatory ensembles. Matriculating at an international music school is an lifelong investment. When you join a network of esteemed alumni, forge long-lasting connections with faculty members, and spend years intensely focused on your major with a cohort of peers, you are planting seeds that will flourish again and again.